This year is the 50th Anniversary of the first quartz watch to be released for sale, the legendary Seiko Astron. The quartz based timing technology went on to power almost all modern technology, from computers to vehicles to mobile phones. 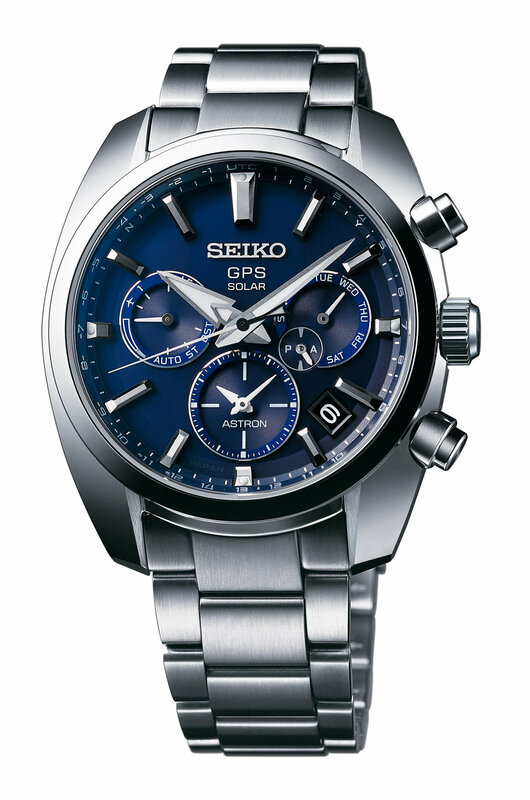 It was this revolutionary watch that Seiko named the world’s first range of GPS solar watches when introduced in 2012. These modern Astron models sync their time via the GPS network to ensure that you always have the correct time wherever you are in the world. Last year Seiko introduced the latest addition to the Astron line with the new slimer 5X series of calibers. This year at Baselworld Seiko announced four new models to the line up and these will all be available in September. The first is the limited edition SSH023 that has a black case and bracelet along with a zirconia ceramic bezel with fifty facets commemorating the 50th anniversary of the original Quartz Astron. The dial markers and hands are also shaped like quartz crystals in reference to the revolutionary technology. The watch is supplied with both a stainless steel bracelet with a super hard coating along with an extra-strength silicone strap. In addition to the limited edition SSH023 there are also three additional models. These include the blue dialled SSH019 and the black dialled SSH021 that are both cased in stainless steel with super-hard coating and supplied with a bracelet. The third model is the SSH024 with a very dark brown dial and a stainless steel case with super-hard rose gold color coating. This model is supplied with a silicone strap instead of a bracelet. I must say this Astron announcement did surprise me not for what was announced but for what was not. The press release from Seiko tries to draw parallels between the case design of these models and the original Astron but a casual comparison shown that the design is very different with the more rounded case corners and square lug cutout on the original not replicated at all. Considering this year is the 50th Anniversary of what could arguably be called the most influential wristwatch ever released I have a feeling that this will not be the only news we hard about Astron in 2019. As the original Astron was only released to the public on Christmas Day in 1969 Seiko has almost all of the remaining year to commemorate this momentous anniversary.